Over the last couple of years we’ve come to realize that being vulnerable with one another builds a level of trust, which ultimately results in cooperation. Google did an entire study on it, and in his book The Culture Code, author Daniel Coyle outlined more research that quantified exactly how much closer we feel to individuals who are vulnerable with us: 24 percent. Which begs the question: if organizations are merely a group of individuals, why are we not expecting that same vulnerability from companies? Why, at an individual level, are we all about showing empathy and being honest, but at a corporate level we’re still about bravado and smokescreens? Last year, we got a snapshot of what a vulnerable organization could look like when KFC restaurants across the UK ran out of chicken. (I know, the horror!) 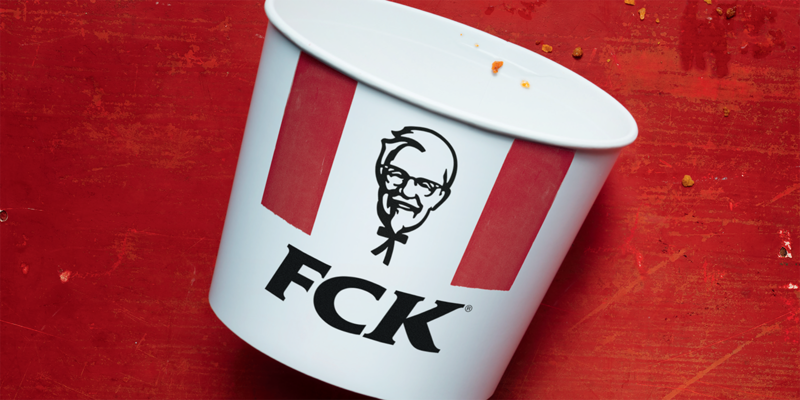 The company were forthright in the fact that their new distribution relationship with DHL had some major teething problems, and made headlines with a cheeky apology ad featuring their iconic bucket emblazoned with the re-ordered acronym FCK. And, as you’d expect, the response from customers was mostly positive. So, if we feel 24% closer to people who are vulnerable with us, what’s the multiplier when a company has thousands of employees all showing vulnerability as part of their daily duties? My prediction is that the next wave of competitive advantage will come from companies who forego ‘saving face’ in favor of showing vulnerability. Not only will this serve active customers better, but if the research is true they’ll begin to attract more customers just by telling the truth about their shortfalls.